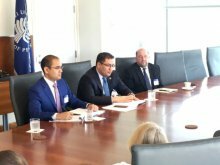 The Minister of Justice of the Republic of Uzbekistan R.Davletov met with representatives of the United States Institute of Peace, inWashington, DC. The United StatesInstitute of Peace is an independent national institute that carries out activities aimed at preventing and resolving conflicts, maintaining peace and stability. Activities of the Institute are aimed at preventing and resolving acute international conflicts, assisting in post-conflict development, increasing funds, as well as developing managerial and intellectual capacities around the world that can contribute to conflict prevention. At the meeting, along with large-scale reforms implemented in Uzbekistan, activities of the Ministry of Justice were also widely covered. The sides discussed issues of reforms carried out in socio-economic sphere and registration of non-governmental and non-profit organizations, as well as the role of the Ministry in ensuring the rights and freedoms of citizens, as well as the priority areas of possible cooperation. Following the conversation, detailed answers to questions were given.Priority areas for further cooperation were identifiedon the basis of the expressed views and proposals.